Home AVFC Supporters Brigada 1874 Sponsored Supporters at Villa Park for Sky TV – Brigada 1874 Respond! 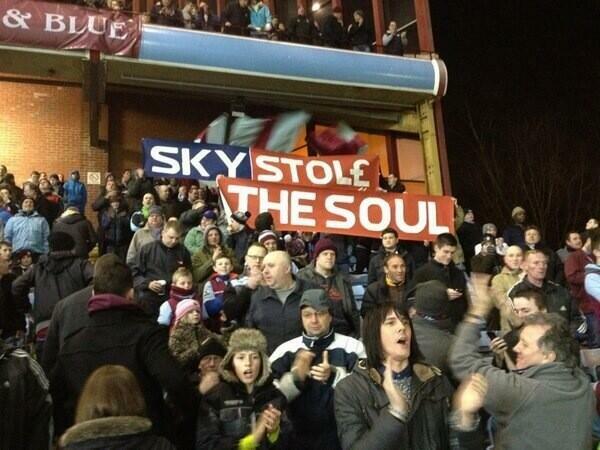 Sponsored Supporters at Villa Park for Sky TV – Brigada 1874 Respond! Call me sentimental or a traditionalist, but with Saturday March 2nd being the exact day of the 125th anniversary of the day Villa President William McGregor wrote the letter that led to the formation of the football league, it would have been nice to have seen Villa actual put on on performance to honour the occasion and show Manchester City who was actually responsible for that league title they won last season. Alas, the game was chosen to be screened live though, by the new founders of the football league, Sky Sports. 125 years? In the Sky universe, the more important fact was this was Villa’s 800th game in the Premier League. Was that why two astronaut fans had come to Villa Park to celebrate the occasion? No, unfortunately, they were just sent from Planet Lynx to advertise deodorant (look closely at the branding on their suits) as part of Unilever big astronaut-themed ad campaign for their Lynx brand. It’s interesting that clubs now sell in-seat advertising space…or to give it a proper name – sponsored supporters. OK, fair-play to Lynx for their humourous and original stunt with the Benteke banner, but it is in the strict sense a company taking liabilities by pretending to be Villa supporters (did they pay the club to do so?) for the Sky TV cameras. Fairplay to the Brigada 1874 boys. Right on cue too. Ready even for visitors from out of space. Now that is living up to the Villa motto ‘Prepared’ UTV. The words “in seat advertising space” make me want to vommit my balti pie.